This might be my favorite lunch that I made for GMA. 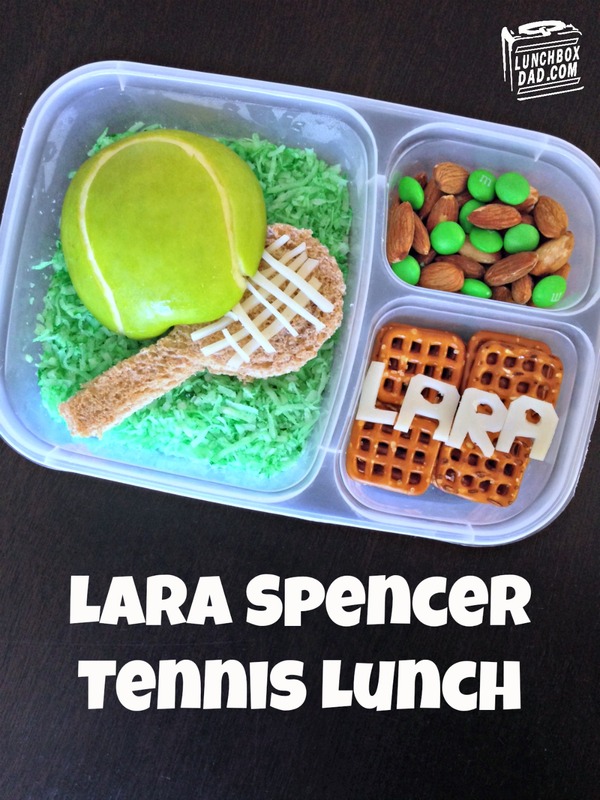 I am sharing it this week because Wimbledon just wrapped up so if you have a tennis fan in your family, this is an easy and fun lunch to do! You can customize the name on it for the person you are making it for. Special thanks to Kendra from Biting the Hand that Feeds You for the tennis ball idea. It is made in an Easy Lunch Boxes container. 1. Put half bag of shredded coconut in resealable plastic bag. Drop in 10 drops green food coloring. Seal and shake until the coconut becomes green. Put in 1-2 more drops if necessary. Arrange coconut in main container to cover the bottom. 2. Cut slice of bread into tennis racket shape as shown in picture. Repeat with second slice. Cut turkey lunchmeat and cheese into small circle and place between bread “rackets” to make a sandwich. Put sandwich in main container. 3. Cut thin slices of provolone cheese and arrange in a grid on top of sandwich. 4. 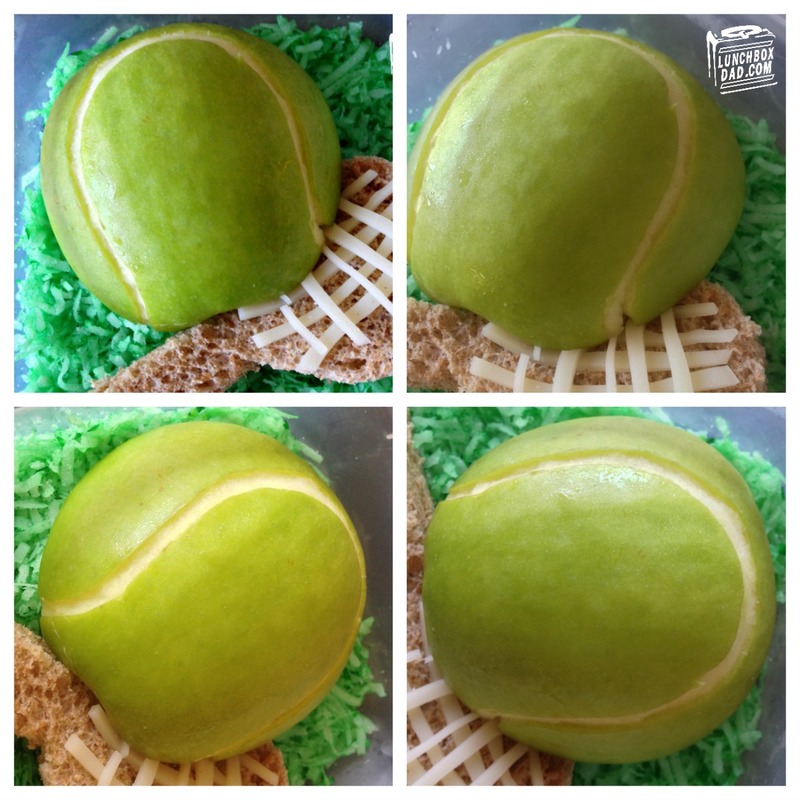 Cut green apple in half and carefully make shallow cuts that just break the skin to form the seam of the tennis ball. For shape see picture. Gently stick knife underneath edge and pry up apple skin along the cut until only white is showing. 5. Immediately slice a lemon and rub the wedge along the back of the apple and anywhere else you made a cut. This will prevent the apple from turning brown. 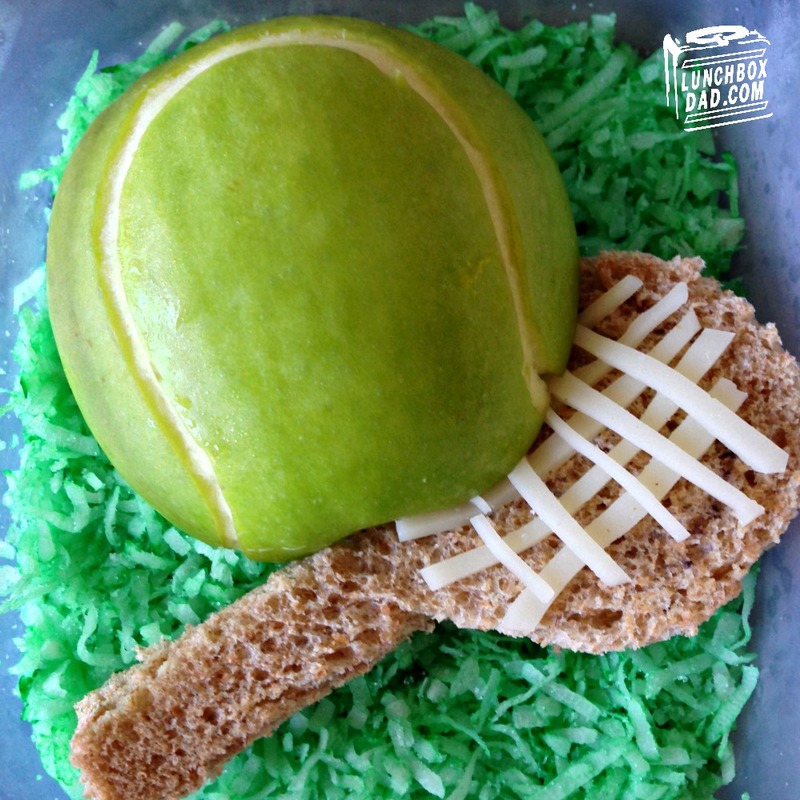 Place apple slightly on top of tennis racket sandwich as shown. 6. In one side dish place pretzels. Use slice of provolone cheese to cut out Lara’s name. Arrange on pretzels. 7. In second side dish put mixed nuts and green M&Ms.